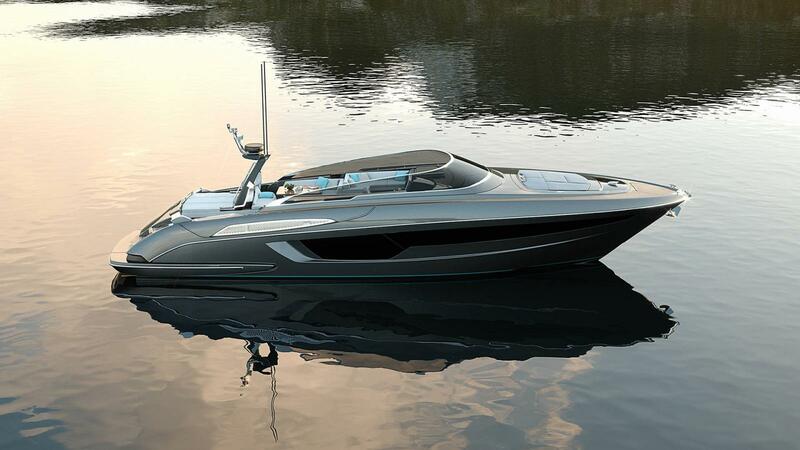 Riva reveals the design for its latest open yacht at BOOT 2017 in Düsseldorf, ahead of its debut planned for late spring this year. It only happens at Riva, the only yachting brand to have left its mark on both the social scene and the world of design: every new yacht is an event that leaves owners and enthusiasts with bated breath until the magical moment of its unveiling. Those who just couldn’t wait and simply had to be the first to discover the secrets and latest features of the new Riva 56’, this magnificent open yacht was revealed during BOOT 2017 in Düsseldorf. 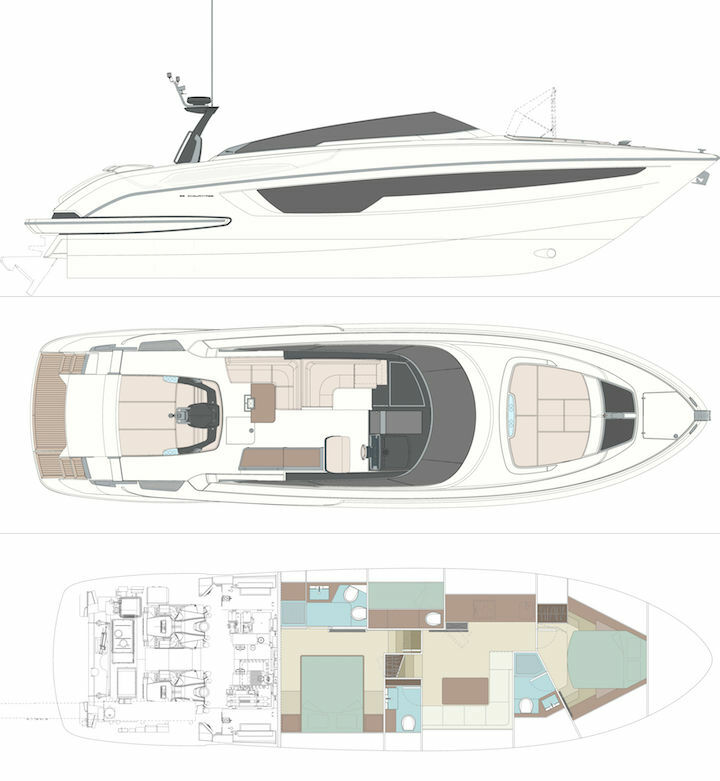 The new vessel is already in build at the Sarnico yard and will make its debut before the end of the spring, joining the fleet that includes some icons of the yachting world, from the Aquariva Super to the more recent Rivamare. The yacht has a completely new hull form and brings the most popular technical and design choices on board, as well as innovative features and elements offering even higher levels of comfort than those that have highlighted the success of Riva yachts over the last three years. 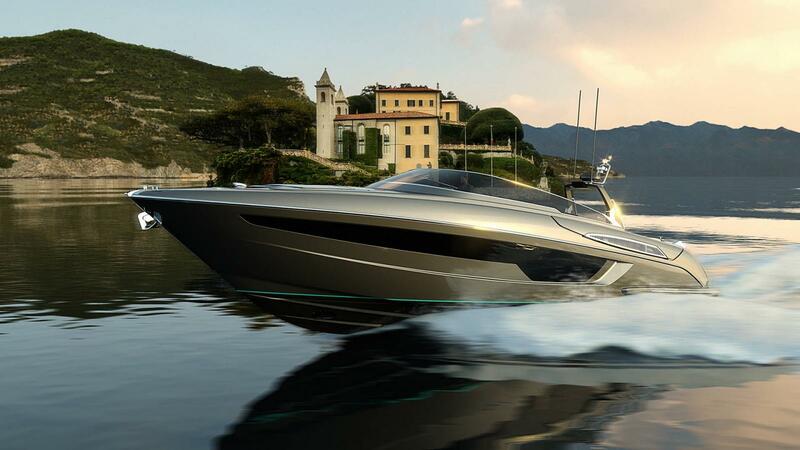 The Riva 56’ is the result of the joint efforts of Officina Italiana Design - the studio founded by Mauro Micheli and Sergio Beretta – Ferretti Group’s Product Strategy Committee and Engineering Department. 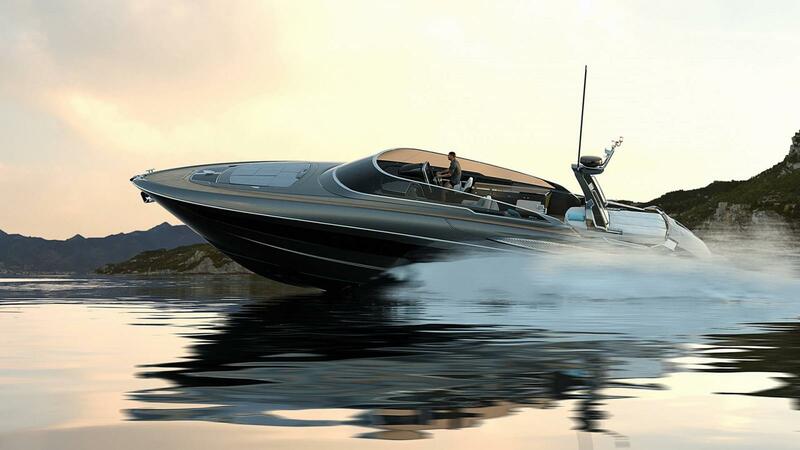 The result is a stylish combination of the most prestigious materials and attention to detail that has always been the hallmark of the Riva world: from the high gloss mahogany of the interiors to the natural teak of the exteriors, the lacquered finishes and stainless steel, mirrors, glass and leather. The sleek look of the new 56’ inherits and expands the stylistic traits that characterised the latest generation of opens and coupés by Riva. So you will find large glazed windows running along the hull with flush portholes, aggressive metallic colours on the exteriors (the first vessel will be in Shark Grey) and opulent detailing in stainless steel and wood. The seamless windshield protecting the superstructure completes the aerodynamic profile, a true masterpiece of engineering and design. In the stern, the Riva 56’ introduces an important new development in the system used to move the swimming platform. As you walk down to the swimming platform, the steps continue under water to reveal additional steps built into the hull. This new feature makes it possible to go directly up into the cockpit without having to use the steel ladder, although this is also available for use. The aft area features a garage accommodating a Williams 325 tender behind the carbon fibre hatch. In the cockpit, the mooring gear is housed in a compartment in the bulwark, covered by a stainless steel grille, as in other recent models. Even the fairleads are made entirely of stainless steel. The living space has been cleverly organised with a generous sundeck in the extreme stern that feels almost suspended over the waves and leads into the lounge on the main deck. Underneath the roll bar, the comfortable forward-facing sofa combines with the L-shaped sofa and teak dining table to form a pleasant area to enjoy lunch, with a slightly raised dormeuse, next to the bridge. To starboard, the cabinet unit can accommodate a fridge, ice-maker, grill, sink and storage compartments, and stretches as far as the bridge seating and is integrated into its base. The roll bar not only adds a finishing touch to the profile, it also acts as a support for the antennas. In case of bad weather, or if the owner simply wants some shade, the electro-hydraulically operated bimini top can be opened, as can the clear side shields, offering excellent protection for the area. Access to the engine room will be possible through two hatches on the bridge, one in the centre of the cockpit and the other on the left aide aft. The foredeck has a sun pad that can be protected with a top, and there is a glazed floor area with a special non-slip surface set into a stainless steel frame, completed by the ship’s horn fitted in a marvellous vintage case in high-gloss stainless steel – a tribute to Riva’s glorious past. The technical mooring space in the bow completes the area. The standard layout offers two guest cabins and three bathrooms, with a dinette, galley and crew cabin with separate access. The master cabin amidships has an en-suite bathroom on the left side. The L-shaped dinette and galley are just as you go below deck, featuring mirrored surfaces and a vast amount of storage compartments, plus fridge and TV. The glass hatch cover increases the natural light in the dinette. Forward is the VIP cabin and its many storage areas. The addition of a day head accessed directly from the dinette is an important benefit, as it makes it possible to exploit the full potential of the open for day cruises with several guests who can use this facility without having to enter the master or guest cabins. The crew cabin has a single bunk and head, with separate access from a hatch in the cockpit, concealed by the dormeuse. It can be substituted with a third guest cabin on request. 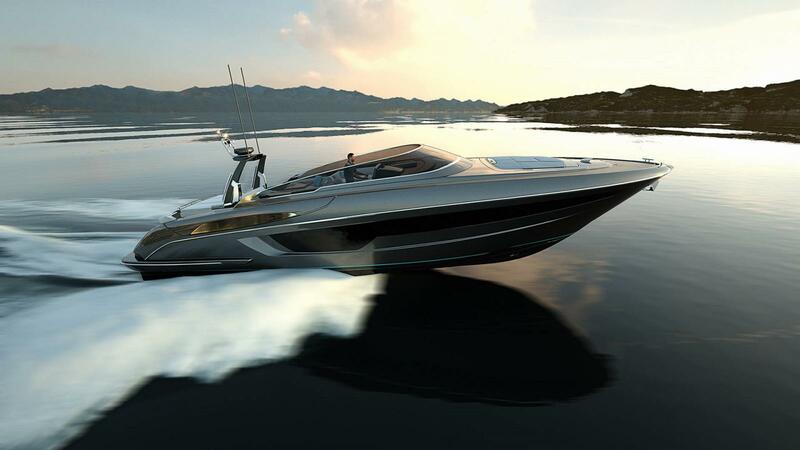 The Riva 56’ will be fitted with twin 1000 HP MAN engines, or twin 1200 HP MAN engines on request. Both configurations feature a V-Drive propulsion system and, again on request, a Seakeeper stabiliser can be fitted to minimise roll when underway and at anchor.